To celebrate the amazing things being done at Sanford Children’s Hospital, we’re inviting you to join us March 5-11 in celebrating #ChildrensHospitalsWeek. Donations to Children’s Miracle Network have helped purchase life-saving equipment and fund unique programs at Sanford Children’s Hospital. 100% of every dollar given supports the sick and injured children in our region. Wear a Band-Aid. 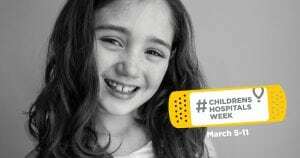 Show your support for Sanford Children’s Miracle Network by wearing a Band-Aid of your choice, taking a photo, and sharing it with the #ChildrensHospitalsWeek hashtag. Tune in to CMN Hospitals’ Facebook Live-athon at 7:30 p.m. EST on Wednesday, March 7. This two-hour live fundraiser, broadcast from Walt Disney World, will feature inspiring pediatric patients from the U.S. and Canada and entertainment from celebrity guests. Watch live on Facebook at Facebook.com/CMNHospitals. Instagram: I’m celebrating @Sanford_CMN and #ChildrensHospitalsWeek! Donate. Children’s Miracle Network Hospitals treat 62 kids every minute. Donations stay local to fund critical treatments and healthcare services, pediatric medical equipment and charitable care.